Looking at the fraternity of the broken, music succeeds where script does not in Claire van Kampen’s uneven historical play. Time is out of joint at the Belasco Theatre, where Shakespeare’s Globe Theatre has taken up temporary residence with Farinelli and the King. Claire van Kampen’s 2015 history play tells an 18th century Spanish story on a replica of the Globe’s Sam Wanamaker Playhouse stage, itself a replica of London’s 16th century Blackfriars Theatre. 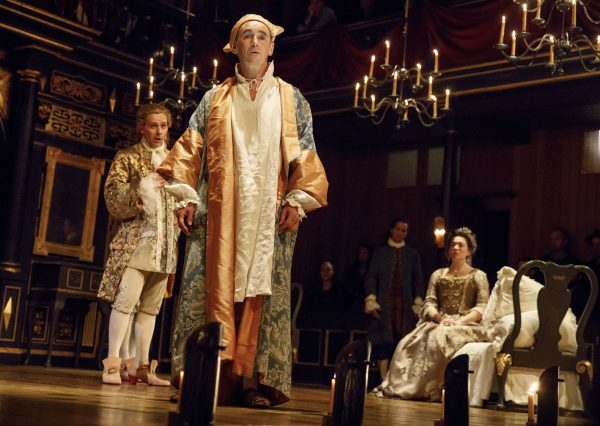 Though Farinelli speaks with a modern argot, the play resolutely and almost admirably refuses to speak to modern concerns, despite its timely exploration of unsound rulers and nebulous nationalities. Like its troubled eponymous monarch, the production slips in and out of lucidity, only overcoming its disquietude through music. Like Hamlet, time is vexing mad King Philippe V of Spain (Mark Rylance) as well. What we now call bi-polar disorder has left him unable to set it right. “Time lies,” he tells his Chief Minister, De la Cuadra (Edward Peel), while he is covered in clocks all giving a slightly different hour. Isabella (Melody Grove), his second wife, is so moved when she hears famed castrato Farinelli (Sam Crane) sing in London that she hires him on the spot as Philippe’s personal music therapist. Farinelli holds a complicated relationship with his angelic voice, which has brought him unimagined fame yet is only possible because he was castrated at age ten. Nothing bonds as well as damage, and Farinelli and Philippe form an instant fraternity of the broken. In Farinelli’s most ingenious device, Crane is joined onstage by a countertenor (Iestyn Davies or James Hall) whenever his character sings operatic arias. This is a pragmatic solution to the play’s acting/singing demands, but also a beautiful theatrical expression of one of its central ideas, expressed early by Philippe to his goldfish: “Everything produced in this world has its shadow.” Both Phillipe and Farinelli are haunted by the duality forced on them by their public titles and personas. Phillipe knows he is the leader and figurehead of a nation but he is in conflict with his duty and his own mind. “I am not famous. Farinelli is,” the castrato tells the king. While the countertenor (Davies on the night I visited) sings, Crane merely stands, rapt, possessed, haunted. As their relationship progresses, Farinelli and the king become each other’s shadows. They grow more and more like each other as the play advances: Farinelli offering Philippe mental clarity and the king giving Farinelli an escape from the pressures of his unasked-for gift. The pair move out to the country–a pastoral paradise that allows them both to escape the public’s relentless demands–with a largely superfluous Isabella in tow. The play’s shadows are literal as well. Flickering candles (standard practice at the Wanamaker) are hung overhead in the Belasco and set in footlights. They are barely bolstered by soft electric lights. This period effect is amplified by painted drops and the onstage chamber orchestra in the musicians’ gallery. Period authenticity has been a key marketing point for Shakespeare’s Globe since it opened on London’s South Bank 20 years ago (with Rylance as its first artistic director), yet such authenticity has always been dubious at best, based in no small part on the lack of concrete historical evidence for many of its stylistic elements. It made sense for Ariane Mnouchkine’s Théâtre du Soleil to recreate La Cartoucherie, their home base, at the Park Avenue Armory earlier this month for A Room in India, since the play itself served as a sort of reckoning with the company’s own work over the last half century. Here, though, plopping the recreated Wanamaker stage on the Belasco’s feels like a simulacrum too far, nudging the Globe towards the theatrical Disneyland detractors repeatedly accuse it of being. A second act breaking of the fourth wall to draw the entire audience into the world of the play only highlights how difficult it is to engender the Wanamaker’s intimacy in even a comparatively small Broadway house. Where other actors might employ more mundane, clichéd signifiers of mental illness, Rylance makes his Philippe a petulant child. It’s often unclear whether his pampered royal is suffering the ravages of disease or simply leveraging his unpredictability to achieve his own personal and political ends. Yet Rylance’s performance seems bored, even programmatic. Van Kampen, his wife, has written him a role replete with bons mots which he delivers with relish but hamstrung by a razor-thin affective palette. Van Kampen’s gift for embedding anachronism in lush, sophisticated, classically-inflected compositions has made her music an ineffable part of the Globe experience for two decades. Her work is as academically rigorous as it is surprising and natural, yet her playwriting debut shows her to be a much stronger philosopher-poet than a dramatist. The play is rich with ideas, echoes, and allusions, and as such is catnip to theatre history nerds. But Farinelli gives the impression of a Shakespeare play with all the action removed, leaving only the concepts. I didn’t buy a single relationship outside of Farinelli and Philippe’s, especially a shoehorned romantic triangle subplot in act 2. John Dove’s flaccid direction only increased the show’s restiveness. And yet, that music… Though Farinelli and Isabella’s love is unconvincing, Handel’s “Cara Sposa,” from the opera Rinaldo, expresses the pain the script can’t. Van Kampen’s musical selections and arrangements elevate her own play, just as they have for countless Globe productions. “Time. It’s a strange thing. It curls one way then takes you round the other way so you meet yourself coming home,” theatre impresario John Rich (Colin Hurley) tells Farinelli in a letter near play’s end. Farinelli and the King is too plastic and opaque to allow anyone to meet herself, yet it still provides an opulent illustration of the healing power of song. Davies’ crystalline mezzo-soprano is worth the price of admission alone. It’s his Farinelli who makes the flowers bloom in act 2, and his voice that sets time back in joint. One of the play’s many profound truths is that beauty is unalterably bound up with abject pain. That’s not a new idea, of course, but how lucky for us that Farinelli’s sacrifice nearly 400 years ago is still bearing such exquisite fruit.